What a healthy snack for yourself or to serve to your guests. The dip is creamy and tangy and when roasted, the beets taste like little pieces of candy. Beets are not only delicious, but they are also really good for you. They provide a good source of vitamin C, iron & magnesium, fiber and potassium. They also provide a good source of antioxidants. The dip can also be served as a salad dressing. We served it with a roasted vegetable salad and it was so amazing. Start with roasting the beets. Place sliced beets into a large mixing bowl and toss with a couple tablespoons of extra-virgin olive oil. Mix until thoroughly coated. Lay them out onto a baking sheet and bake in the oven for 30-40 minutes, until they start to turn dark and little crispy around the edges. Flip them halfway through the cooking time. While the beets are roasting, making the dip. Place the garlic and ginger into a food processor and process until minced. Add the remaining ingredients and blend until smooth. Remove from food processor, scraping down the sides and place in a serving bowl. 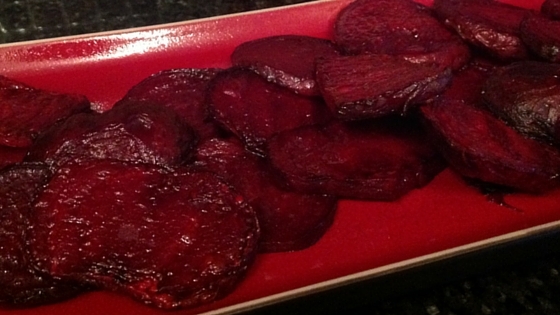 Remove beets from oven, place on a serving platter and serve with dip. If you are using the dip as a salad dressing, add a couple splashes of water into the food processor. This will make it easier to toss with the salad. If you like this recipe and you think someone else might as well, please share. To create a movement of Contagiously Positive health, we have to share what we learn and love.